As the morning sun burst over the horizon, the bush was set ablaze with color. The red sand absorbed the heat and soon the animals were feeling it. "This is going to be a hot day. It’s only sunrise and already I’m parched," Kiah complained. "I’m heading for the billabong. I’m going to have a long soak." The platypus waddled towards the water. "She’s right. It’s going to be a warm one. We’d better have a splash about and then a long drink before we try to find our way back," Wandi, the kangaroo suggested. They spent the next few hours playing in the cool water. "Are we ready?" Yinki laughed. "I have a craving for a wichetty grub. I can’t wait to get back to my tree," the kookaburra sighed. "Me too," Banjori agreed. "My mouth’s watering for a delicious eucalyptus leaf," the koala said, licking his lips and patting his round, furry tummy. "There’s no use in complaining. If you’re all ready, climb into my pouch with Boomerang and we’ll try to retrace our steps," Wandi urged. One by one the animals squeezed into the tight pouch. "This is not comfortable," Jiba moaned. "What are you complaining about? You’re an echidna, with sharp spikes that poke everyone," Daku, the wombat said. "I can’t feel my legs," Tinka cried. "Boomerang, move your tail." "You’ve got a tail too," the joey complained to the skink. "I can’t feel my legs either," Nimu said, "and I’ve got eight of them." "Mum, Nimu’s hairy legs are tickling my tummy," Boomerang giggled. "I’m a trap-door spider. What do you expect me to do with my legs?" Nimu growled. "Is everyone settled? I’m ready to hop now," Wandi said to the unruly crowd of animals. She leapt toward the trees, leaving the cool waters of the billabong behind. The sun beat down on them all. "I’m hot, mum," Boomerang complained. "It’s crowded in here." Wandi looked at her joey. "Patience, Boomerang. Patience." After an hour on hopping, they all dozed off. Wandi was grateful. At least she didn’t have to listen to their complaining for a while. She spotted some boulders in the distance and headed for them. "They look familiar," she muttered to herself. "Maybe I’m heading in the right direction after all." As she neared the sandstone rocks her ears began to twitch. "What’s that noise?" Banjori woke up and yawned. "Why have we stopped?" he asked. The others woke up as he spoke. "What’s the matter?" Daku asked. "Shhhhh. We might have some trouble. It’s Boomer and Old Man," Wandi whispered. "Who is Boomer?" Tinka asked. "Who’s Old Man?" Yindi wondered. "They’re two male kangaroos. They’re known as the ‘Bullies of the Bush’. If they spot us, they’ll surely give us a hard time," Wandi sighed. "I’m not afraid of an old man. I’ll poke him with my spikes," Jiba, the echidna threatened. "His name is Old Man. He’s not an old man. He’s a powerful kangaroo and I’m afraid he’s a bit nasty and mean," Boomerang replied. "Oh. Why don’t we go that way then?" Jiba asked, pointing to the left. "I say we go that way," Kiah said, pointing to the right. "I say we go back to the billabong. At least it’s safe there," Yindi chimed in. Just then the two male kangaroos looked their way. "Oh no, they’ve heard us. Here they come," Wandi cried. "Stay in the pouch!" she warned. Within seconds Old Man and Boomer were standing in front of Wandi and the others. "What have we here? Look at this will you, Boomer. It’s a flyer with a pouch full of bush animals. Have you ever seen anything so funny in your life?" Old Man laughed. Boomer reached over and grabbed Kiah by her bill and pulled her out. "Well, well. If it isn’t a platypus. What’s a duck-bill doing out of the water?" He tossed Kiah into the sand. She landed on her back. "What else have we in there?" Boomer stuck his hand in and pulled Tinka out. "It’s a skink. Show me your blue tongue," he demanded. "I don’t want to," Tinka shivered in fear. "If you don’t show it to me, I’ll have to yank it out of your mouth," Boomer laughed. "Leave her alone. You two are bullies. Why don’t you go and jump off Ayer’s Rock?" Boomerang said. "Look, Boomer. 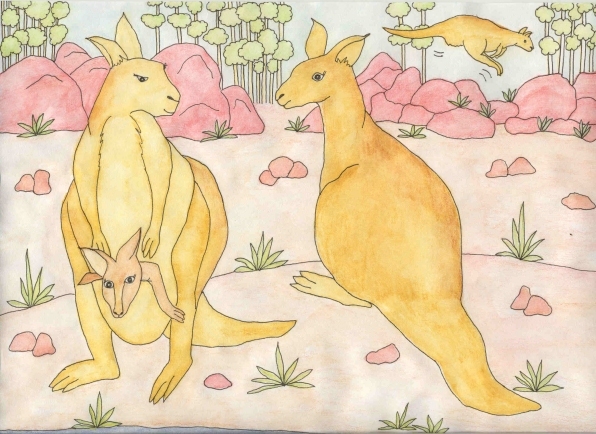 The joey’s the bravest of them all," Old Man chuckled, pulling him out by his tail. Wandi had enough. "Leave them alone! Tinka and Kiah, climb back into my pouch. Boomerang, inside," she demanded. The platypus struggled to roll over. She and the skink climbed back in. The joey followed. "You’re awfully brave for a doe, aren’t you?" Old Man snarled. Once the rest of them were safely in her pouch, Wandi lifted her legs and kicked Boomer as hard as she could. He went flying through the air. "Let’s get out of here!" Banjori shouted. Wandi hopped away as fast as she could. "Boomer stood up and brushed the dirt off his fur. "We’ll get you. You can’t run from us," he shouted. He and Old Man hopped after the flyer. "Hurry, Wandi. They’re coming after us," Nimu said. Wandi hopped as fast as she could. She didn’t stop until she was back at the billabong. "Quick everyone, climb out and hide," she said. Kiah ran into the pond. Banjori climbed to the top of the nearest tree. The wombat and trap door spider found a small cave and squeezed inside. Jiba rolled into a ball and hid herself in the tall grass. Tinki slithered under a rock and Yindi flew into the branches of a tree. "Where are we going to hide?" Boomerang asked his mum. "Stay in the pouch," Wandi said. She hopped down to a stream and hid behind a tree. It didn’t take long for Boomer and Old Man to arrive at the billabong. "You think you can hide from us? We’ll get all of you!" Boomer shouted. The two kangaroos searched high and low, but couldn’t find any of them. Just then Old Man spotted Wandi. "She’s down by the stream," he whispered to Boomer. "Let’s get her!" They hopped towards her. "Stay away," Wandi cried, as the two kangaroos moved in on her. "We’ll teach you to run away from us," the bullies sneered. Boomer was about to give Wandi a kick when out of the stream crawled a huge crocodile. It must have been fifteen feet long with huge teeth. "You two bullies giving this doe a hard time?" It opened its mouth wide and ran after Boomer and Old Man. "A croc!" screamed Old Man. "Run!" The two of them hopped away as quickly as they could. "You’re safe now," Rando said. He could see that Wandi was nervous. "Don’t worry, I won’t eat you. I’ve had my fill for the day." Seeing that the croc wasn’t going to harm them, the others came down to the stream. "If there’s one thing I can’t stand, it’s a bully! Two of them is even worse." "Thanks for saving us," Wandi smiled. "I don’t suppose you know the way back to the baobab forest, do you?" she asked. "Can’t say that I do. I don’t wander too far away from here," Rando said, looking at the stream. "Keeps me cool. It’s home," he laughed. They spent another night at the billabong with their new friend, the croc. "Tomorrow’s another day," Wandi told them. "We’ll try another way then." They feasted on barramundi, bugs, and eucalyptus leaves, and slept soundly, knowing the bullies were gone, for now at least.